As I've tweeted, blasted, mentioned, exclaimed, and lamented, I have written and published a collection of essays. Self-published, mind you. Who's the patron saint of lost causes? Maybe we should ask him. Seriously? It was part passion and part test. Passion, meh. I've considered myself a writer since about 1976. Since no one else seemed interested in publishing a collection of my work, well, hello CreateSpace. The test part? I'll explain: The essays, for the most part, were written and ready to go. Self-publishing has come so far so fast, I could no longer write off the option (pun intended). But the writing projects nearest and dearest to my heart really need color and great graphic design IMHO. I felt I needed to walk before I could run, if you will. My essays and black and white images seemed like a great place to start. I'd love to know what you think of my book of Dumb Things. Leave a comment here or reach me via Twitter or my Dumb Facebook page. Join in the fray and help scientists learn whether words have anything to do with our sensory perception. It'll take 20 minutes of your time and you just might learn something. The publishing industry has changed at least as much as any other has in the past five years. While traditional publishing contracts are far less lucrative as they once were, self-publishing has come a long way, baby. No longer the vanity press, ugly stepchild option for misfit writers, self-publishing has legs. Many published authors - people who have actually received royalty checks - have chosen the DIY route. Some self-published books later garner contracts from traditional houses - though perhaps not all that you've heard about. A few forward-thinking agents are playing along. I've decided to dive in, too. I had a great experience with my first book - a regional hiking guide, published by Menasha Ridge Press - but other manuscripts have languished. Yes, in part, I'm diving in out of frustration. But in spite of Harold Underdown's cautions, I believe it's time. I hope you do too. 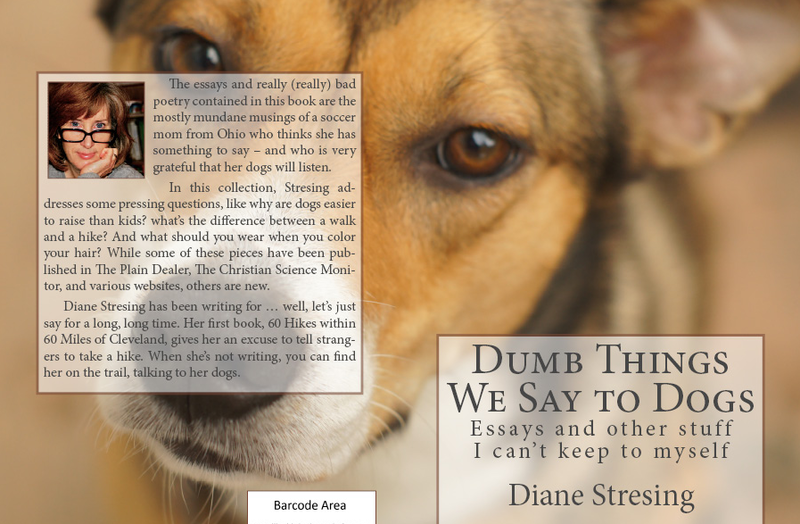 Dumb Things We Say to Dogs is now available... and oh, you better believe I'll welcome your thoughts on it! This is personal, and just barely related to writing. On breaking one's neck is a fascinating personal account of a traumatic injury. In it, a patient aptly describes how individual professional caregivers and the bigger system of healthcare affect the care process. It is not political. It juxtaposes the best of our medical system (the patient was saved by it) with the stupid holes/tangles that exist in the medical industry. It is worth a thoughtful read. The author's experience in a trauma unit and then a rehab facility sounds almost identical to my own, nearly 10 years ago. It's confounding to think that we have fabulous medical care - the best - and yet apparently we have not improved on in a decade so many of the ridiculous man-made problems inherent in it. And on the human interest side of things, Relman sure makes 90 look good! It's a safe bet that Timothy D. Wilson, a professor of psychology at University of Virginia, believes in the power of the pen. Wilson's studies have noted that our emotional well-being is tied to how we recall events - and more importantly, how we reshape our recollections. Some evidence suggests that writing exercises designed to essentially revise a personal "story" (read: self-image) can be life-changing (in a good way). What the heck. Pull out a pen and a notebook and write your way to a Happy New Year.